Welcome to Marvel Strike Force Heroes page. This is the full description of MSF Thanos stats, skills and abilities. Thanos is a brutal Mystic Protector who hits all targets and drains their health. His first skill delivers medium damage and grants Counter to Thanos. His second skill inflicts heavy damage to the single target applying Offense Down on the enemy and Taunt on Thanos. Thanos ultimate hits all targets for 210% of his base damage and drains 100% of damage done. While taunting Thanos has increased resistance to the point that he is immune on all enemy debuffs and additionally he has a chance to provide ability energy to himself and all Cosmic allies after each kill. Thanos is a very powerful tank but he can be obtained only through infinity orbs and his price is 100 shards. Thanos is a Titan Eternal who delivers crushing blows that drain foes and taunt his enemies. Attack primary target for 80% damage + 50% chance to apply Offense Down. Gain Taunt. Attack all targets for 110% damage + 50% Drain. This attack cannot miss. 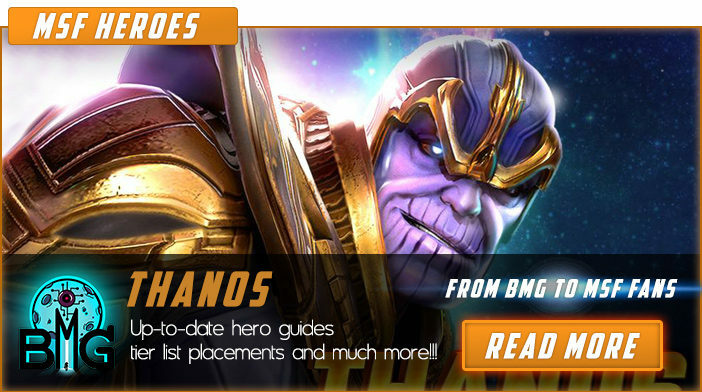 We hope that you enjoyed the description of MSF Hero Thanos. For detailed information about other MSF Characters check our MSF Heroes page.